Only one museum in the U.S. has been designed by a woman. 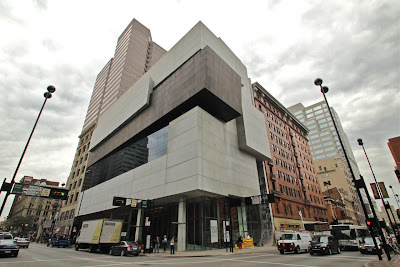 The Contemporary Arts Center of Cincinnati was designed by Zaha Hadid, an Iraqi-born English architect. One of her early projects, it just opened a few years ago. Since I'm interested both in architecture and women's achievements, I really wanted to see the building, even though contemporary art doesn't generally interest us. Our travel destination for the day was Columbus, but Cincinnati was only a hour out of the way, so we decided to swing by there. We left at 10:30, and it took two hours to drive to Cincy, as they call it in Ohio. The museum is located right downtown, and preparations for Octoberfest had brought in a crowd. Using the iPad mapper, we managed to locate it quickly, and a hotel bellman directed us to a nearby underground parking structure. We came out in Fountain Square, where the noise and chaos drove me crazy. Once we got out of the plaza and onto an intersection, we could see the dramatic building of the arts center down the block. I'm sorry to report that the building did not impress me very much. (Of course, you have to take into account the overcast sky, which brings out the worst in most buildings.) Its outer form is like an uneven stack of gray blocks, with one black block extending beyond the others. It looks heavy and brutish, compared to the older, more refined buildings around it. It does have a certain drama, and it asserts the importance of art, while being accessible from the sidewalk, like a department store. Located on a corner, the shape makes a dramatic façade on both streets. The entire museum was closed for installation of two new shows to open that night; it appeared to be the usual insignificant, ephemeral stuff. They allowed us to photograph the foyer, and to take the elevator to the 6th floor. The most interesting feature of the building was the staircases. 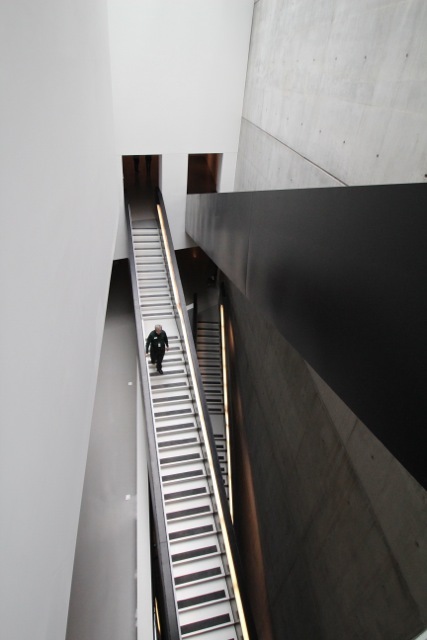 A small one leading downstairs was angled in such a way that descending felt like falling; an optical illusion. 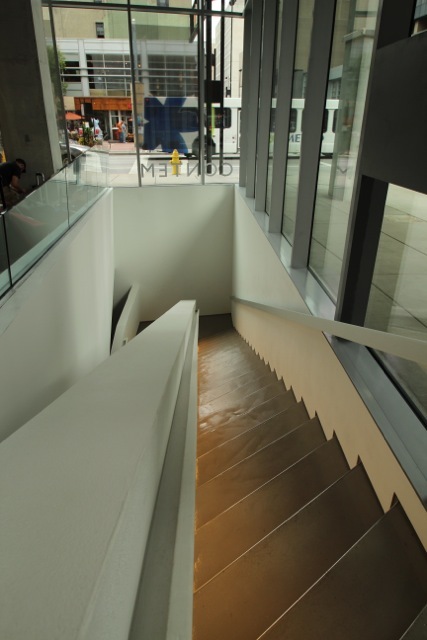 The major staircase zig-zags wackily up all six floors; the steps are shallow but broad. From the sixth floor we could take photos down the stairwell. 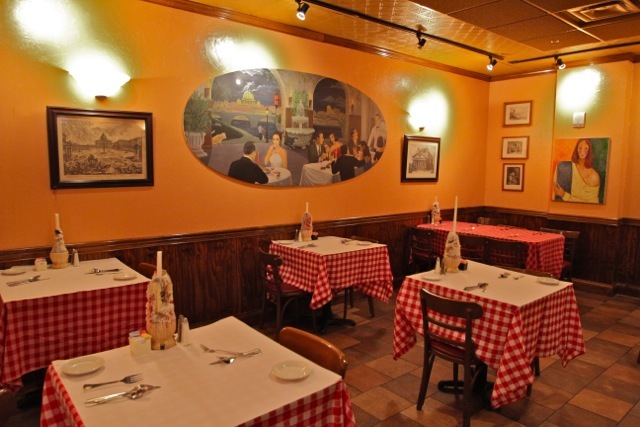 For lunch, I had researched a nearby Italian restaurant, Trattoria Roma. It turned out to be second-rate, both food-wise and service-wise. The décor was nice, and it was interesting to watch the pedestrians through the window. 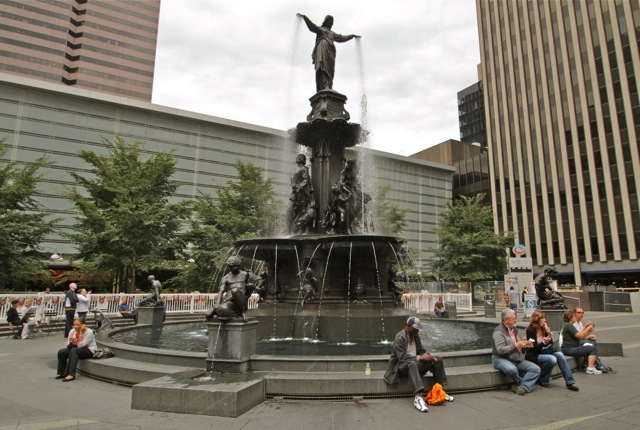 Then we walked back to Fountain Square and took some photos of the famous fountain, with its three levels of bronze figures. Then we had two more hours of driving to Columbus: gray sky, rolling hills, some crops. As we approached the city, the navigator on the car really saved the day by changing the route to avoid a huge traffic jam on the freeway. I used the iPad mapper to understand the route better. Our entrance into Columbus was easy and we quickly found our way to the Holiday Inn City Center. Dinner at the hotel's café was a bust. I could taste the freezer burn on my salmon; Dan's pork chop was stiff. Everything about the food preparation and the service was careless; the worst meal we've had in years.